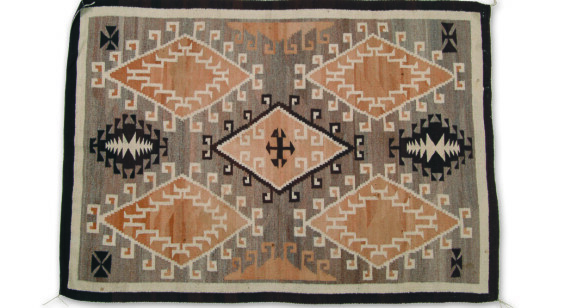 The Bair Museum in Martinsdale showcases several rugs from the museum’s Navajo weaving collection in the Special Projects Gallery from September 6 to October 31, 2015 and from May 27 through June 26, 2016. The exhibit is entitled Walk in Beauty – Navajo Rugs from the Bair Family Collection. This special display takes its title from the Closing Prayer of the Navajo Blessing Way Ceremony.Most of the weavings in the Bair Collection are from the Transitional Period between 1890 and 1925 and reflect the influence of J.B. Moore. While Moore’s Crystal Trading Post was only in business until 1911, and Charlie Bair purchased the Martinsdale, Montana ranch in 1913, the patterns he developed continued to be woven into the 1940s and were offered by other traders who succeeded him in New Mexico. The exhibit includes a Revival-Style Third-Phase Chief’s Blanket, an early Two Grey Hills weaving and an early Crystal Rug. Most of the weavings in the Bair Collection are from the Transitional Period between 1890 and 1925 and reflect the influence of J.B. Moore. While Moore’s Crystal Trading Post was only in business until 1911, and Charlie Bair purchased the Martinsdale, Montana ranch in 1913, the patterns he developed continued to be woven into the 1940s and were offered by other traders who succeeded him in New Mexico. The exhibit includes a Revival-Style Third-Phase Chief’s Blanket, an early Two Grey Hills weaving and an early Crystal Rug. 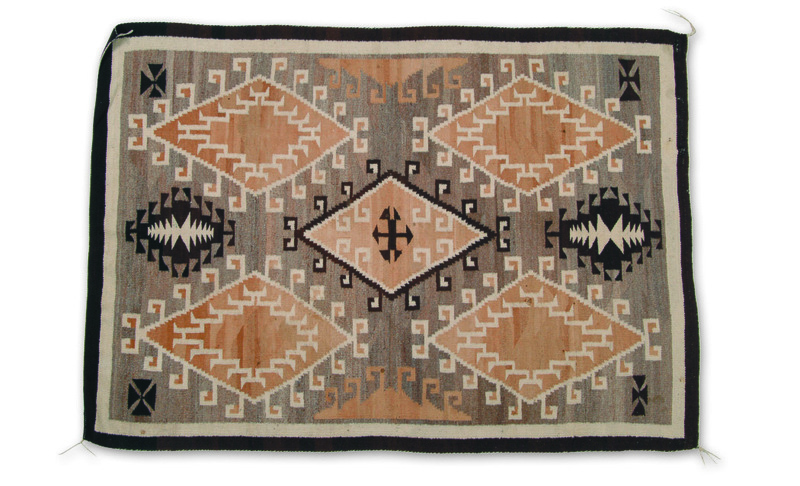 The Bair Collection of early twentieth-century Navajo weavings offers a snapshot of rug collection by a prominent Montana family at a time when Navajo weaving was undergoing a critical period of change referred to as the Transitional Period. It is unknown if Charlie Bair purchased these weavings all at once for the Bair ranch home or if the collection grew over time. The Ye’ii Bicheii pictorial weavings were collected by Marguerite and Alberta Bair at a later time. While the Bair sisters remodeled the ranch house to accommodate their expansive European antiques collection, they continued to honor and appreciate the Western art and objects left them by their father Charles Bair. The Pine Room remained much like it has been during Mary and Charlie Bair’s lives. The rugs were originally scattered throughout the Pine Room and surrounded by the family’s Native American beadwork collection.